Green-eyed Cat, originally uploaded by Temeculamom. I have little time lately to blog, because the tenants who are renting out our old house are moving out this week, and I have to make all the arrangements. Today I am driving (about 2 1/2 to 3 hours both ways) out to pick up the keys and meet a locksmith to change the locks. I am also meeting with two sets of prospective tenants with rental applications in hand. We will have plenty of cleaning and repairs to do over the next 2-3 weeks. Wish me luck!! We really do need to get this house rented out to some good people. We have been very lucky in our tenants so far, but our latest ones just bought their own home. This photo I shared is a photo Isabella took of our cat. 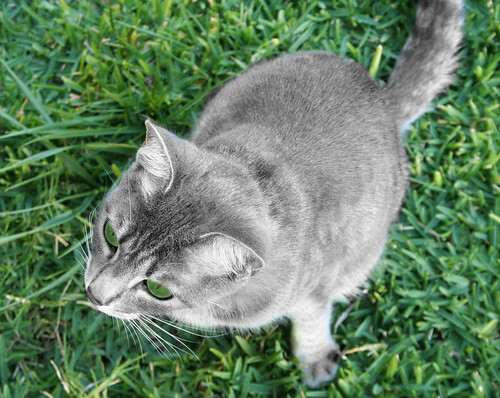 Then she desaturated it in photoshop, recolored the grass and painted Smudge’s eyes to match. All this after about 30 seconds of instruction from me (I am no photoshop expert, either). Anyway, she was pretty excited because she won first place in photography in her whole school, and then in the district as well! ~ by bekaboo on January 9, 2009. Way to go Isabelle! I’m proud of you. that pic is REALLY cool! Sounds like you’ve got a busy months ahead! GL with the interviews. kudos to Isabelle..her eyes look awesome…. good luck with renting your place. Wow that is am awesome picture! I wish I were that good with photoshop, I struggle and forget how to do things continuously! Wow that is an awesome picture! You have a fast learner on your hands. Thats great. Congrats on winning Isabella! Good luck with the rental too! Talent runs in the family but you’re a good teacher too….